This newcomer to Massachusetts has been moving rapidly northward through the state. First documented in 1988 in Longmeadow near the Connecticut border, it was next seen to the east, in Rhode Island and in south Dartmouth, Massachusetts, and by 2012 had expanded throughout eastern Massachusetts as far north as Essex County. By the 1950’s there may have been some Zabulons in Massachusetts, and the species was certainly well known in Connecticut. Klots (1951:251) mentions Massachusetts as the northern edge of Zabulon’s range, as do Opler and Malikul (1992: 294). However, there are no Massachusetts museum records or literature reports from this period or earlier. Our current known records of Zabulon Skipper date only from 1988, when Roger Pease discovered a small colony at Fannie Stebbins Refuge in Longmeadow, in the Connecticut River valley just north of the Connecticut border. This and a Springfield sighting were reported in the 1986-90 Massachusetts Atlas. Since 1988, Zabulon Skipper has dramatically expanded its range eastward and northward in Massachusetts (see below). In the 1980’s Zabulon’s continental range was from the Massachusetts border at Longmeadow, through Connecticut and southern New York, west across the southern end of the Great Lakes to central Iowa. It extended south through the southeast coastal plain to mid Florida, with disjunct populations in Mexico. The Hobomok Skipper’s range is more northerly; it overlaps with Zabulon through Ohio, Indiana and Illinois, but from there extends northward into Canada (Opler and Krizek 1984; Layberry 1998). Zabulon Skipper has also been increasing in several nearby states. In Connecticut, the 1990-95 Atlas found many more specimens during the project period than had existed in all previous years (108 project to 48 pre-project), suggesting that the species had become more common there. Atlas specimens are from further east along the coast than were pre-project specimens. The northernmost specimens are from the Connecticut River valley (O’Donnell, Gall and Wagner 2007). In New York, Zabulon has probably moved up the Hudson River valley since the 1970s. Whereas in the 1970s it was known only from Long Island and two other southern counties, by the 1990’s it had been found in more northerly counties (Shapiro 1974; Glassberg 1993: 90; Gochfeld and Burger 1997:248). In Rhode Island, although Zabulon was listed on the 2007 checklist as rare (Pavulaan and Gregg 2007), recent postings to the state listserve indicate that it is more widespread and frequent than previously thought. In particular, it was seen on the June 28, 2008 NABA Count in Newport, setting an easternmost record for Rhode Island, and was photographed on Block Island 9/3/2008 (Lewis 2008). That same year, the coastal records were pushed further east in a photographed sighting by E. Nielsen on 9/13/2008 at, Allens Pond Sanctuary, Dartmouth, Massachusetts. Zabulon and Hobomok Skippers use somewhat different host grasses, with Zabulons often choosing Tridens flava (purpletop) and Eragrostis spp. (lovegrass), whereas Hobomoks use Panicum and Poa spp. (Scott 1986). The Connecticut Atlas observed Zabulon Skippers ovipositing on orchard grass (Dactylis glomerata) in the wild, but raised it on panic grasses, little bluestem and Kentucky bluegrass in the lab. Zabulon Skipper probably uses a variety of grasses in the wild, and its full range of host plants has not been fully investigated, especially in Massachusetts. Like Hobomok, Zabulon is somewhat associated with woodlands, but is also adaptable to man-made habitats. It is found in variable situations, especially damp, second-growth grassy fields near woods. It easily adapts to suburbs, parks and gardens, including “shaded weedy lawns and city parks” (Cech 2005; NatureServe 2012). At Fannie Stebbins Wildlife Sanctuary in Longmeadow, Zabulon Skippers are found in a grassy river floodplain. At Fowl Meadows in Milton Sam Jaffe reported them associated with a large patch of dogbane along a road through a marsh, near the edge of a red maple swamp (8/13/2010 masslep post). Since its discovery in Massachusetts in 1988, Zabulon Skipper has moved from being a "rare vagrant," as it was called in the 1985-90 Atlas years, to being an established part of our fauna. MBC sightings 2000-2007 ranked Zabulon Skipper as “Uncommon,” about on a par with Pepper and Salt Skipper and Fiery Skipper (Table 5). It has become more common since then. Zabulon Skipper was reported in 18 of the 22 years 1992-2013 (Chart 102). Its sighting frequency exploded in 2012 and 2013 as it expanded into eastern Massachusetts. But prior to 2008 the only known locations were in the lower Connecticut River valley, primarily Fannie Stebbins WS in Longmeadow. For those years Chart 102 reflects mainly counts in the Longmeadow area. On 8/7/1999 at Longmeadow Fannie Stebbins 39 were counted by T. Dodd et al. and another 14 were counted at Springfield Forest Park by T. Gagnon et al. On 8/19/2000 at Fannie Stebbins, 59 were counted by T. Gagnon (42 m., 17 f.) and only 3 at Forest Park. These two years, 1999 and 2000, were the peaks (Chart 102) in the Longmeadow area. After that numbers at Fannie Stebbins declined to single digits until about 2010. Annual MBC sighting trips and counts were taken each year in mid-August, however, and by 8/17/13 the high count was back up to 39 (19 trip participants). From 1988 until 2008 Zabulon Skipper was known only from the lower Connecticut River valley, primarily from Fannie Stebbins Wildlife Sanctuary in Longmeadow, along the river, but it was also occasionally seen in the nearby towns of East Longmeadow, Springfield, and Hampden, as well as to the north in Holyoke, Amherst, and Northampton. After 2008, Zabulon's range was dramatically extended (Stichter 2013a). Note: Fannie Stebbins Wildlife Sanctuary is owned by the Allen Bird Club of Springfield, Massachusetts, and is private property. The policy, recently re-affirmed, is that NO COLLECTING of insects or other animals or plants is allowed on the Refuge. In 2008 Zabulon Skipper was first reported in eastern Massachusetts (Map 102a). One male was found at MAS Allens Pond WS in south Dartmouth (9/13/2008 L. Miller-Donnelly, photographed by E. Nielsen). At the time, this was the easternmost sighting along the south coast; there had also been two 2008 photo-reports from the Rhode Island coast. By 2009 there were additional sightings of individuals in September from Allens Pond and from nearby Acoaxet and Westport Sylvan Nursery. By 2010, sightings in May and June in this area suggested that the species was probably over-wintering there. A male was reported 5/28/2010, and two on 6/3/2010 at Allens Pond by L. Miller-Donnelly, and one photographed on 6/6/2010 by E. Nielsen. In August 2009 the species was also discovered further north: M. Arey reported two males on 8/23/2009 from Fowl Meadows, Milton, just south of Boston (Lep.Soc.Seas.Sum. 2009). This report was confirmed the next year by S. Jaffe, whose sightings included 2 males in June (6/15/2010 S. Jaffe), photographed, suggesting that the Milton colony was also over-wintering, with two broods. Three males were seen on 8/13/2010 by S. Jaffe, one photographed on 8/14/2010 by M. Rainey, and one on 8/15/10 by B. Zaremba (see above). In June 2011 fresh males were again found at the Milton colony. Finally, in 2010, there was also a report from Martha’s Vineyard, a fresh male found 7/23/2010 in Edgartown, Manuel Correllus SF, M. Arey. This was the first report ever from Dukes County. All new locations added between 2008 and 2010 were in eastern Massachusetts. 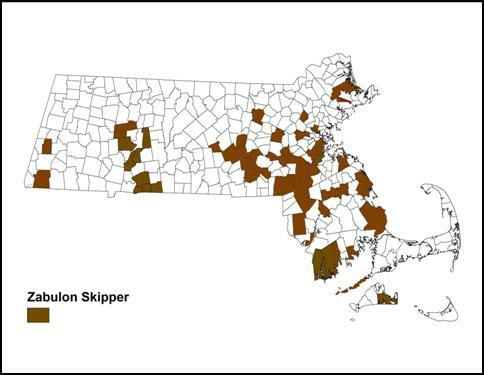 By 2012, Zabulon Skipper had radiated throughout eastern Massachusetts (Map 102b). It was reported as far north as Topsfield and Wenham in Essex County, (Wenham Canal 8/27/2011, 2, M. Arey; 8/12/2012 Topsfield Ipswich River WS, M. Arey), and west to Worcester in Worcester County (8/11/2012 Broad Meadow Brook WS, Worcester, H. Hoople). It also moved a bit further north in the Connecticut River Valley, being reported in 2012 from Whately (8/2/2012, B. Benner). This was the first known report from Franklin County. By 2013, Zabulon Skipper had been reported from even more towns in eastern Massachusetts, as well as from the southern Berkshires: Sheffield (1, 7/27/13 M. Arey and A. Grkovich and 2, 8/10/13, G. Dysart) and Stockbridge (1, 8/31/2012, B. Cassie). It was also found in Williamsburg (1, 8/17/2013, C. Duke, ph. ), in the mid-Connecticut River valley. Reports from Concord, Medford (M. Rines photo), and Waltham (J. Forbes, photo) filled in areas around Boston. Photos from Whately confirmed that as the northernmost locale in the Connecticut River valley, and there were also photos from Amherst and Holyoke. Around Worcester there were confirming photos from Paxton and Shrewsbury. There were continued reports from Newbury and Wenham north of Boston. Zabulon was even reported from Cuttyhunk Island in the Elizabeth Islands (2 on 9/21/2013, fide B. Cassie), but other than that seemed curiously absent from Cape Cod. By 2014, three photographs from the North Shore fully confirmed the species' presence there: 8/29/2014, Boxford, R. Hopping; 8/30/2014 Ipswich River WS, M. Watson photos on Facebook; and 9/7/2014 Rowley Rough Meadows WS, B. Zaremba, photo on pbase. Rowley became the northernmost location along the coast. From north central Massachusetts, one photo-report and one sight report demonstrated a new northwestward range extension there: Petersham 9/14/2014, W. Howes, photos; and Lancaster 8/30/2014, R. Anderson. Around Worcester, Zabulon was reported for the first time from Northborough Crane Swamp Trail (6/16/2014, S. Moore). And a report with photograph from Barnstable Long Pasture WS (9/15/2014, J. Dwelly) became the first evidence of the species' movement onto Cape Cod. Overall, the rapidity of this range expansion in Massachusetts has truly been dramatic. A time series of three maps can be found in Stichter 2013a. The expansion took place particularly in 2011, 2012 and 2013; there were sightings in 8 new towns in 2011, 26 new towns in 2012 and 15 new towns in 2013. From 1992 through 2013, Zabulon Skipper had been reported from 63 of a possible 351 towns in the state. Selected 2012-2013 reports with higher numbers are: Dartmouth Allens Pond, 24 on 8/19/2013, G. Dysart; Longmeadow Fannie Stebbins WR, 39 on 8/17/2013 T. Gagnon et al. ; Mattapoisett Nasketucket SR, 28 on 8/14/2012, F. Model; Milton Fowl Meadows, 12 on 7/28/2012, M. Arey; Northbridge Larkin Rec. Area, 15 on 8/3/2012, B. Bowker; Raynham Borden Colony, 25 on 8/19/2013, J. Dwelly. Zabulon Skipper has two to three broods throughout its range; probably two in Massachusetts. 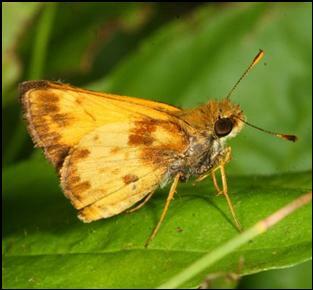 The Connecticut Atlas reports two generations for Zabulon Skipper in that state, “late May to late June" and "early August to mid September” (O’Donnell, Gall and Wagner 2007). In New York state, a few observations of single Zabulon Skippers flying in October have led observers to speculate that in some years there may be a partial third brood, for example on Long Island, N.Y.
Hobomok Skipper, on the other hand, has only one flight. The first or spring flight of Zabulon Skipper here coincides with the flight of Hobomok Skipper, making it sometimes difficult to separate the two (especially the females) at locations where they are both flying (e.g. East Longmeadow). For this reason, and because of Zabulon's rarity until very recently, the spring flight of Zabulon Skipper was not well documented in the 1993-2008 records, shown at (http://www.naba.org/chapters/nabambc/flight-dates-chart.asp). The second flight, in August, is very well-reported, since that is when club trips targeting this species have taken place. The most numbers have been reported from the first three weeks of August, but that may simply be a result of the concentration of search effort at that time. May, April, and early June sightings were not reported at all until 2007; they have now been reported from several locations: East Longmeadow (4/28/2012, 5/8/2010, 5/25/2009 and 5/27/2007, K. Parker, from her yard); Allens Pond Dartmouth (5/28/2010 L. Miller-Donnelly); Fowl Meadows Milton (6/15/2010 S. Jaffe); and New Bedford Business Park (6/10/2011 S. Stichter), and Natick and Holyoke. Over-wintering colonies thus likely at or near all these sites, as well as two broods, since in-migration from further south seems unlikely. Two broods in Massachusetts are further indicated by a particularly good series of reports in 2007 and 2009 from one location, Karen Parker’s yard in East Longmeadow. In 2007 Zabulons were seen there by Karen Parker from 5/27 to 6/27 and again from 8/12 through 9/1/07. In 2009 Zabulons were seen from 5/25 to 6/12, and again from 8/23 to 9/23/2009. These dates are about the same as those reported for Connecticut. Latest sightings: In the same 22 years of records 1992-2013, the six latest "last sightings" are 10/16/2012 Westport, L. Miller-Donnelly; 10/3/2013 Ashland, D. Pugliafico; 9/27/2011 Dartmouth Allens Pond, B. Bowker; 9/27/2000 Amherst, D. Minear; 9/24/2003 East Longmeadow, K. Parker; 9/19/2009 Westport Sylvan Nursery, L. Miller-Donnelly. The Atlas late date had been in August. Zabulon Skipper is dramatically expanding its range northward through Massachusetts, and should continue to do so if winter temperatures remain mild. The numbers of this skipper seen in Massachusetts will probably increase due to overall warming climate (Table 6), although there will be some yearly fluctuations. Zabulon Skipper is already having two broods at this latitude; it normally has three in some southern states. It is known as an adaptable and widespread species. Wet meadow habitat for this interesting new arrival should be protected. Maintenance of open moist areas containing the host grasses may require occasional mowing to keep shrubs from encroaching (See http://www.naba.org/chapters/nabambc/butterfly-conservation.asp for mowing guidelines). Research is needed to determine what grass species are being used as hosts in Massachusetts.